Insulin resistance in type 2 diabetics could be eliminated in a mouse model by an enzyme inhibitor. If the results were to be transferred to humans, would it be a blessing for all those concerned – or rather a free ticket for absolute self indulgence? Eating without reflecting on the effects and no more insulin injections – will everyday life for type 2 diabetics soon look like this? If the results of animal experimentation are able to be transferred, diabetics in the future would be able to live a greatly unencumbered life – at least in the richer industrialised countries. Working on mice with diabetes, a new drug, administered once daily, eliminated the symptoms of obesity-related diabetes. At present, diabetes medications can only keep the disease in check and minimise consequential damage; curing the condition has not been an option. 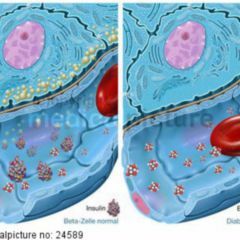 Since insulin resistance is not reversible, many diabetics need to inject insulin sooner or later in order to regulate their blood glucose levels. If this does not occur, the consequences of such damage are heart and kidney disease, nerve damage and vision problems. Described in biochemical terms, the insulin receptor is a tyrosine kinase, which after activation by insulin phosphorylates several molecules, thereby initiating a network of intracellular metabolic processes. The reverse process, ie. the inactivation of the insulin receptor, is controlled by tyrosine phosphatases, which dephosphorylate the insulin receptor. One of these enzymes Is LMPTP (low molecular weight protein tyrosine phosphatase). Scientists from the University of California in San Diego have now discovered a molecule that can selectively inhibit LMPTP. The convenience therein: the active ingredient is obtainable orally, so it does not have to be injected as does insulin. “We first eliminated LMPTP in mice in the whole body and then in individual tissues”, the immunologists write, further adding: “Our studies showed that LMPTP is significantly involved in the onset of diabetes caused by obesity”. 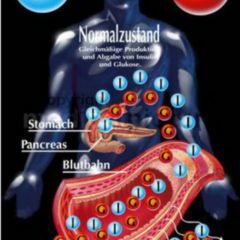 The diabetes-promoting processes took place in the liver. There the loss of LMPTP increased the phosphorylation of the insulin receptor in response to insulin. “We suspect that LMPTP plays a key role in the development of insulin resistance, and that inhibiting this enzyme is an approach to curing for type 2 diabetes”, according to Stephanie Standford. This hypothesis was confirmed by experiments with mice. Working with animals which developed type 2 diabetes due to a high-caloric diet, daily administration of a selective LMPTP inhibitor was able to reverse insulin resistance. The animals were after the medication intake once again capable of regulating their blood sugar levels. Side effects did not occur in the mice during a period of 4 weeks following treatment. What’s more, their weight was not affected by the LMPTP inhibitor. LMPTP is not an unfamiliar element in the context of type 2 diabetes. When the immunologists completely eliminated the gene which encodes LMPTP in mice, the animals did not develop any diabetes, despite a particularly high-fat diet. Further experiments have shown that such far reaching intervention is not absolutely necessary. The same effect was achieved by the immunologists when they only “crippled” LMPTP in the liver. This increased the activity of the insulin receptor, but without apparent side effects. Should the LMPTP inhibitor also work in this form in humans, the molecule would be the first therapeutic agent that can reverse insulin resistance. 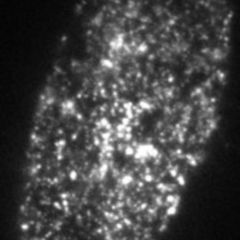 Tyrosine phosphatases have long been spotlighted by scientists who work on diabetes medications. To date, however, efforts to inhibit one specific enzyme have proved unfruitful. If other tyrosine phosphatases are also eliminated, undesirable side effects occur. 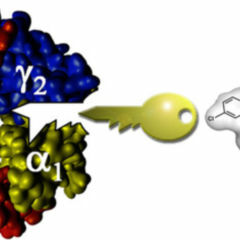 “Our compound inhibits the target enzyme very specifically. The next step is to now test whether LMPTP is safe for people. Then we can test its effect in clinical trials”, says Standford. LMPTP inhibitor could also be useful in looking beyond diabetes type 2, because LMPTP has already been implicated in cardiac failure and tumour growth. “The genetic makeup of humans suggests that the LMPTP inhibitor could also be relevant in human applications”, the immunologists write. Whether this assumption is confirmed, however, will have to be shown through further studies. There certainly would be enough demand: there are always more people worldwide suffering from type 2 diabetes. This usually occurs in later stages of life and is associated with severe obesity and lack of exercise. Diabetes causes enormous costs in the health care system: “Each year diabetes and its sequelae bring with them costs of around 673 billion euro for treatment, care, disability and early retirement. This is because poorly adjusted blood glucose each year leads to amputations, new cases of blindness, to a life of dialysis or heart and vascular complications: three quarters of all people with diabetes ultimately die from heart attack or stroke”, says the IDF Diabetes Atlas. Open ticket for self indulgence? Yet would an effective human LMPTP inhibitor really be a blessing? Would it not be a free ticket for obese people to no longer have to pay attention to their weight? Advanced obesity has other causes, Professor Matthias Blüher, head of the adiposity outpatient clinic for adults at the University Hospital Leipzig (Germany) tells German newspaper Süddeutsche Zeitung. He lists the reasons: unfavourable eating behaviour, slow metabolism, and unfavourable bacterial colonisation of the intestine. “These, however, are all factors that cannot be influenced very well in those affected”, Blüher says, “for one knows from studies that up to 70 percent of obesity problems are genetic”. For those concerned, obesity is thus hardly something that can be prevented. Diabetes reversal by inhibition of the low-molecular-weight tyrosine phosphatase. Stanford, S.M. et al. Nat Chem Biol. 2017 Mar 27. A symbol I used to indicate “less than” seems to cut-off the message every time. Firstly, I don’t agree with your bold statement that “insulin resistance is not reversible”. I believe that in the majority of cases it is – with a VERY healthy diet and exercise. I am “surprised” by the way Type 2 diabetes is presented in this article. A new drug is promising diabetics a “free ticket for absolute self-indulgence”. Diabetes “usually occurs in later stages of life and is associated with severe obesity and lack of exercise”. Perhaps you could have said that it is “often” associated … because haven’t you forgotten something there?! What about genetics, high blood pressure or ethnicity, having had PCOS or gestational diabetes? Now then, is this new drug only going to work for “obesity-induced” diabetes or also for the rest of us? I have a healthy (almost vegetarian) diet, an excellent BMI and spend three hours/week at the gym. My mother had Typ 2 Diabetes and my blood sugar levels started to rise several years ago until early this year my doctor ordered a glucose-tolerance test. Aware of the continuum of risk from insulin intolerance to full-blown diabetes, with its various possible side-effects (so well-pointed out in this article), this prompted me to try hard to avoid it.